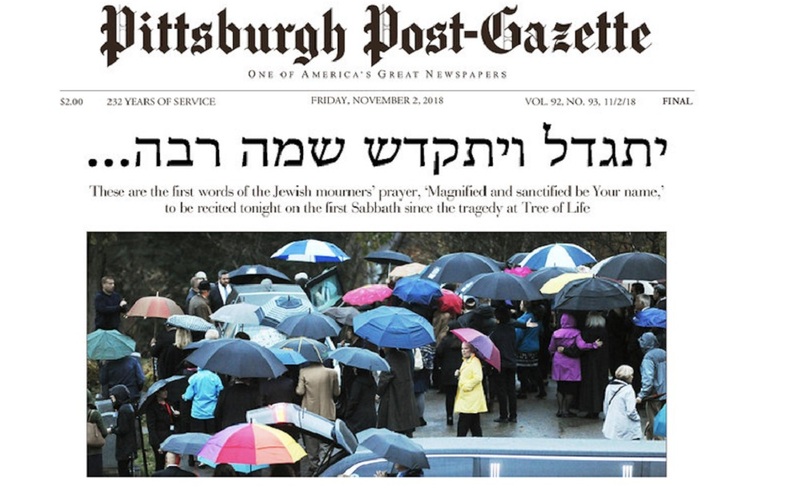 The Pittsburgh Post-Gazette was awarded the 2019 Pulitzer Prize in breaking news reporting for its coverage of the Tree of Life synagogue massacre last October. Eleven people were shot and killed by a gunman during the rampage, which came as congregants at the synagogue complex in Pittsburgh were gathering for Shabbat morning services. The prize, the most prestigious in journalism, was awarded to the daily’s entire reporting staff on Monday. The coverage also included a front-page headline containing the first four words of the Mourner’s Kaddish prayer in Hebrew letters. The Sun Sentinel of South Florida won the Pulitzer for public service, for its coverage of the shooting at Marjory Stoneman Douglas High School in Parkland. Multiple Jewish students and staff were among the 17 killed in the shooting.